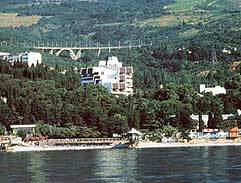 On a complex of bioclimatic indicators Gurzuf concerns the best resort regions of southern coast of Crimea. Picturesque, reminding an amphitheatre, gurzufskaja the valley surrounded with a half ring of mountains, protecting it from cold norths, possesses the unique prirodno-climatic features, favouring carrying out of medical-recreational procedures. Placing: double rooms with all conveniences (a toilet, a washstand, a shower, the TV, a refrigerator). A Food of three single, if necessary - a dietary food. Cold water constantly, hot - daily under the schedule. Treatment: diseases of respiratory organs, blood circulations, the central and peripheral nervous system, cardiovascular system, including a heart attack and stroke consequence, and the oporno-impellent device. Five medical galechno-sandy beaches, the general extent of 240 m.
the Infrastructure: park, bars, restaurants, cafe, a tasting room, a film concert complex, pool, a sauna, a sun deck, sport centre, an exercise room, a tennis court, billiards, hire point, a first-aid post.